Carboxylic Ortho Acid Derivatives: Preparation and Synthetic Applications discusses the principal classes of ortho acid derivatives and their preparation, properties, and reactions. The book is a critical survey and attempts to collate literature regarding the wide array of information on ortho acid derivatives to be of use to chemists studying different sorts of problems. 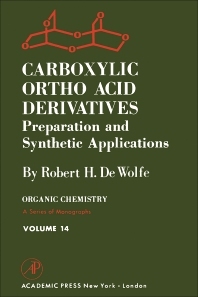 The text is divided into seven chapters, where Chapter 1 begins with a discussion of the general concepts of carboxylic ortho esters, their synthesis, and properties. Chapters 2 to 4 tackle reactions of ortho esters that result to different bonds and bond formations such as (a) carbon-oxygen and carbon-halogen bond, (b) carbon-nitrogen or carbon-phosphorus, and (c) carbon-carbon or carbon-hydrogen bond formation. Chapter 5 discusses the synthesis, properties, and applications of carbohydrate ortho esters. Related compounds and their properties, preparation, and chemical transformations are the topic of Chapters 6 and 7. Some of these compounds are trithioorthocarboxylates, tetrathioorthocarbonates, and amide acetals. The book is a valuable reference to students or anyone else interested in chemistry.